But He answered and said, “I was sent only to the lost sheep of the house of Israel.” But she came and began to bow down before Him, saying, “Lord, help me!” And He answered and said, “It is not good to take the children’s bread and throw it to the dogs.” But she said, “Yes, Lord; but even the dogs feed on the crumbs which fall from their masters’ table.” Then Jesus said to her, “O woman, your faith is great; it shall be done for you as you wish.” And her daughter was healed at once. This is an often misunderstood verse, with implications far beyond it's surface interpretation. The backdrop of Jesus's words is that He has retired to the region of Tyre and Sidon. These were important Canaanite cities, and Tyre was actually mentioned as the western border of the tribe of Asher (Joshua 19:29), while Sidon was included as part of the inheritance of Asher on its northern boundary (Joshua 19:28). While Joshua included it as part of the Promised Land of Israel (Joshua 13:6), the tribe of Asher failed to conquer the land as God commanded (Judges 1:31). I know this is a lot of history about the Biblical Israelites, but it is important to understand that this region where Jesus met this woman was not Israelite by population, but Gentile, and pagan according to their religious practice. And it is logical to wonder why Jesus went there if He, as He stated, was sent only to the lost sheep of Israel. Although it is not specifically stated, I wonder if there were times in Jesus's short three years of ministry that He was exhausted by His increasingly contentious encounters with the Jewish religious leaders. And we can only imagine how draining it must have been to engage with the crowds who were growing and following Him everywhere. If he needed some time away from "the fray", so to speak, then this region might offer Him some respite. That being said, this is only conjecture on my part. So, I would like to suggest that Jesus is saying, My primary mission is to Israel (the Jews), and to step in where the experts in the Law have failed, and guide and transform the people into once again, fulfilling their mission of being God's Chosen. He is attempting to reveal God's Light to Israel, hoping to heal both their spiritual and physical blindness. Jesus knew, as do we, that the covenant was between God and Israel, but "true Israel", so to speak, is composed of Abraham's children within the Jewish AND the Gentile groups. All who are identified as having faith in Jesus are "Abraham's seed". Ministry to the Gentiles will come as a result of His rejection by Jewish believers. As the disbelief increases on the Jewish side, the door to the Gentiles increasingly widens. All this, of course, was part of God's plan. 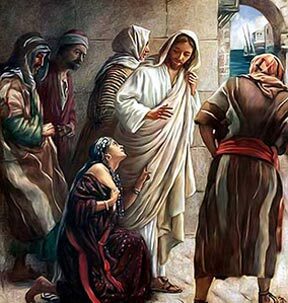 The Bible says in verses just prior to Mark 7:24 that Jesus's fame had preceded Him, and this Syro-Phoenician woman bowed down at His feet, seeking healing for her daughter who was demon-possessed. But what does Jesus say? It is not good to take the children's bread and throw it to the dogs. It is important to recognize that this woman was asking for healing for her daughter. She is asking, on behalf of her daughter, for Deliverance, and she believes that Jesus has the authority to do it. Therefore, we must understand that Deliverance by the authority of Yeshua is referred to here as "the children's bread". He has come to bestow Life-giving bread upon the children of Abraham; the kind of bread that should be part of our spiritual diet; the kind of bread in which every Believer has a right to partake. Jesus, is in effect, telling the woman that it is not His specific mission to bestow this bread upon anyone other than Abraham's children. But her faith is actually stronger than many of the Israelites, who reject the Bread Jesus is offering. She is willing to accept crumbs of Jesus's Life-saving Bread, if that is all He will offer her. Ultimately, her faith is expressed in her confidence that God will help her and her daughter; that healing and deliverance will take place. I would like to suggest that Jesus may not have intended to grant this woman what she asked for, but He may have discerned that her faith came from a genuine confidence in His Father, and since He continually stated that He only did what the Father told Him, might He have received, at that moment, a communication from His Father to deliver healing? That would make sense why He at first refused her request. Remember, He was fully man and fully God, so He must have been continually listening for the Father's guidance on how to fulfill His mission. But I want to go beyond the implications that this woman was seeking the Bread Jesus offered, which afforded Deliverance and Healing for her daughter. As I stated earlier, the Life-giving Bread should be part of our spiritual diet. And we know that Jesus has been given Authority to offer it to us, so that we might be fed. To reject Jesus's Bread, is in effect, living in spiritual malnutrition; and to reject His Healing and Deliverance. After all, His Bread is not a food to be eaten occasionally or leisurely, but is rather, a necessity to sustain spiritual Life. But when it comes to the Church, they don't recognize the full implications of "shepherding the flock"; that it includes guiding, guarding, keeping them in the fold, and feeding them (providing pasture). Ezekiel says, in Chapter 34, "The word of the Lord came to me: “Son of man, prophesy against the shepherds of Israel; prophesy, and say to them—to the shepherds: ‘This is what the sovereign Lord says: Woe to the shepherds of Israel who have been feeding themselves! Should not shepherds feed the flock? You eat the fat, you clothe yourselves with the wool, you slaughter the choice animals, but you do not feed the sheep! You have not strengthened the weak, healed the sick, bandaged the injured, brought back the strays, or sought the lost, but with force and harshness you have ruled over them". See that "strengthening the weak, healing the sick, and bandaging the injured (wounded)"? That's called Deliverance! That's what Jesus did as the Good Shepherd! And if you need to see it in the New Testament, Acts 20:28 says it, too: Pay careful attention to yourselves and to all the flock, in which the Holy Spirit has made you overseers, to care (feed/Deliver) for the church of God, which he obtained with His own blood. Yet, the Church doesn't recognize Deliverance as part of their commitment to the flock. But the saddest portion of this whole scenario is that the Church can't bring Deliverance to the world, without first being Delivered themselves, and they don't even realize it. The Syro-Phoenician woman was willing to accept the crumbs of the Life-giving Bread Jesus offered, knowing it would provide Deliverance and Healing for her daughter. Today, too many Christians in the Body of Christ are in need of a few of those Life-giving crumbs themselves; their need for spiritual healing is that great. But the shepherds of the flock aren't feeding them what they need, and they continue in their weakness, their sickness, and their wounds. No one is discipling the flock or looking for those who have strayed or who are lost. We are too interested in feeding ourselves with bread that has no spiritually nutritious value. No matter how many of those crumbs we consume, they will never make us well. It's time for the Church to seek true spiritual nourishment and true and complete healing. I never knew this was what the scripture was about. Thank you for opening my eyes! Yes, there is so much of the Scripture that we do not understand because we are not taught the meaning of words or the context of the passage. So now it is time for Christians to teach themselves, not relying on the Church's doctrine. I hope this inspires you to dig deep on your own!